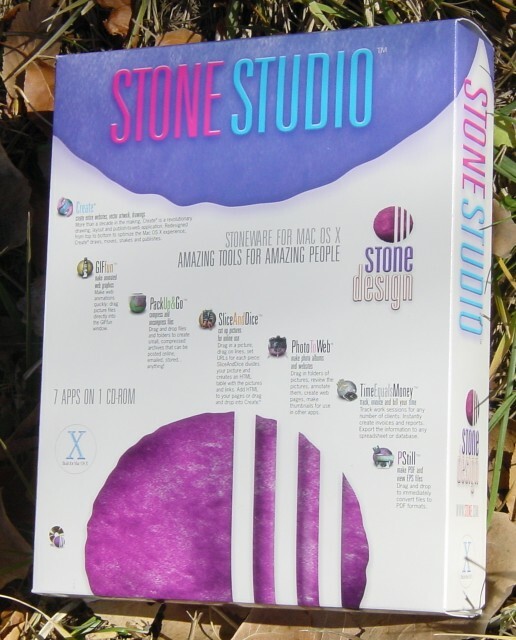 In this session, we’ll briefly introducing the applications that make up Stone Studio, and we’ll work with Create to build a document that we can both print and publish to the web. First, we’ll look at some introductory slides. We made these in Create. Note: this is a .tar.gz file that needs to be unpacked. Drag it into PackUpAndGo, from Stone Studio and then open the resulting Create document. However, these would be more effective as a slide show. Create is fully Applescriptable, so we’ve written a little script that will take each page in the topmost Create document, generate a jpeg image of that page, open PhotoToWeb, our powerful program for working with digital photographs, and display those images as a slide show. ACTION: Open script. Click Run. ACTION: When the slide show starts, click the mouse once to stop the slide show from running automatically. Use the arrow keys to progress through the slides. Create combines the most used features of page layout, drawing/illustration, and WYSIWYG HTML generating programs in one low-priced, easy-to-use package.